Project obstacles and solutions: Jim Parsetich was building a custom home that called for a 4,800 square foot stamped and colored concrete driveway, 3,100 square feet additional stamped patio and sidewalks, of which 30 linear feet were stamped steps. Eric Etchison of Visions in Hardscapes was hired to do the decorative concrete work. The challenge in any high-end finishing application with concrete is to make the material look aesthetically pleasing to the customer, but also to make sure cracking and structural issues are not a concern. Etchison turned to IMI for their imix Spectra colored concrete solutions. One advantage of using imix Spectra as a source for colored concrete is that it is mixed integrally on the trucks. The color is consistent throughout the entire batch of concrete and the same from one truck to the next. IMI delivered 90 yards of imix Spectra Yosemite Sand for this job. Etchison added a brown and gray release to the surface during the stamping application for a modeled finish. This particular job had another challenge. 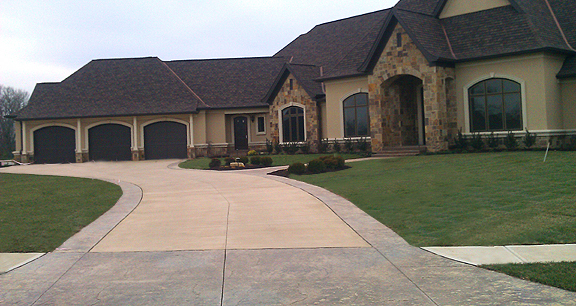 Due to the size of the driveway, a control joint was needed to run down the middle of the driveway. Control joints are placed in concrete to manage cracking in the concrete. This joint had to cover 150 linear feet and followed the serpentine curve of the driveway. Etchison had to freehand the cut. This project won a 2012 Outstanding Concrete Award from the Indiana Ready Mix Concrete Association.